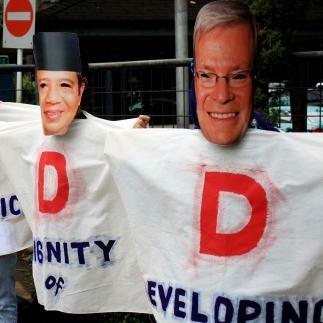 Friends of the Earth Indonesia (WALHI) and Friends of the Earth Australia put out a press release today strongly criticising an A$30 million Australia-Indonesia REDD project in Sumatra, which was announced last week. WALHI and PPJ (United Farmers of Jambi) have also produced a position paper on the project and REDD in Jambi. WALHI and Friends of the Earth Australia are particularly critical of the carbon offsets that are fundamental to this sort of REDD project. “REDD projects will provide a cheap source of ‘offsets’ to count towards Australia’s greenhouse gas reduction commitments,” says James Goodman of Friends of the Earth Australia. ‘Australia REDD offset model violates Australia’s international obligations and should be considered as a fraud: the scheme aims to reduce deforestation is not, in fact aims to create a source of cheap credit for the increase in emissions in Australia.’ said Arif Munandar, Regional Executive Director of WALHI Jambi. Before making emotive statements such as the above, perhaps it would have been better for you all to have talked to the many indigenous people in jambi who resent the loss and degradation of their traditional forest lands …a good REDD program almost by definition will respect both indigenous people’s dependence upon INTACT forest as well as the carbon and biodiversity values. Jambi, in particular western Jambi, has lost huge areas of forest to incomers and large companies with subsequent massive impacts upon local people and their environment who have historically respected and carefully used their forest estate without flattening it. I and my colleagues, most of whom come from forest edge communities in western Jambi believe that a good and well designed REDD program, whether or not it reduces global carbon emissions, has a potential to support sustainable use of forest and secure the rights of villagers to receive their traditional environmental services (clean water, access to NTFP, a safe environment free of floods or, in the dry season, loss or irrigation, guarantee their PLTA (village micro hydros powered by water protected by upriver forest)rather than its destruction for short term economic benefit. Garth Taylor, Trade Commissioner for ASEAN, Austrade. The “environmental record” of some of these companies is very objectional. More information about who is who in the corrupted forest carbon business soon. @Nenek Kincai – Thanks for this comment. The project proponents should also have talked to the Indigenous People in Jambi – before launching their REDD project. You may well be right that a “good and well designed” REDD project “has a potential to support sustainable use of forest and secure the rights of villagers”. However, such a programme must obtain the free, prior and informed consent of local communities and Indigenous Peoples. I also think it’s true that a project that sells carbon credits needs the free, prior and informed consent of the people living near the polluting coal-fired power station that will continue to pollute as a result of buying forest carbon from the REDD project. Another issue with this type of REDD project is that it may stop deforestation in the project area, but because it does nothing to address the underlying causes of deforestation, the palm oil and pulpwood companies will simply move somewhere else (possibly still in Jambi, or a neighbouring province) and continue their destructive activities there. The last two points made by Chris Lang are (of course) entirely valid. Agree. That said, in the end, big pictures are made up of little pixels. If we can change even a few pixels at a time – with full, prior and informed consent of the traditional communities involved, lets do it. We need to shut down the palm oil companies and other corporations pursuing destructive activities. To do so, how about allocating the money from the REDD project that would go into the same hands that are destroying the forests and give it to the government. Logic being that if the government had this compensation maybe they would not have to depend on outside corporations for tax revenue.